Open:All Year .....The St George Lycabettus affords breath-taking panoramic views over Athens to the Acropolis and the Saronic Gulf beyond. Guests are also perfectly positioned right in the pulsing heart of Athens, just steps away from Kolonaki’s alluring shops, museums, galleries and eateries. The St George Lycabettus affords breath-taking panoramic views over Athens to the Acropolis and the Saronic Gulf beyond. Guests are also perfectly positioned right in the pulsing heart of Athens, just steps away from Kolonaki’s alluring shops, museums, galleries and eateries.Family-run since its inception, the St George Lycabettus Hotel is regarded as a landmark of Greek hospitality, with its intuitive service and sleek, newly-renovated rooms. We invite you to stay with us on your next visit to Greece!There’s no better place to experience all that Athens has to offer than from our 5 star boutique hotel in the center of the city. There’s much to love about Athens, and St George Lycabettus is located in a prime position for you to explore all that the city has to offer. Perfectly situated in the city’s luxurious Kolonaki neighborhood, our boutique hotel is just blocks to Syntagma Square, home of Greek Parliament, as well as the best shopping, dining and nightlife in Athens.Explore the suggested attractions below or let our guest relations team suggest a customized sightseeing itinerary designed just for your upcoming visit. Reservations are strongly recommended, and you are kindly requested to reconfirm your reservation with the reception at least 24 hours in advance. In the summer months, enjoy a refreshing selection of juices, cocktails, light fare and more al fresco at our gorgeous outdoor pool. 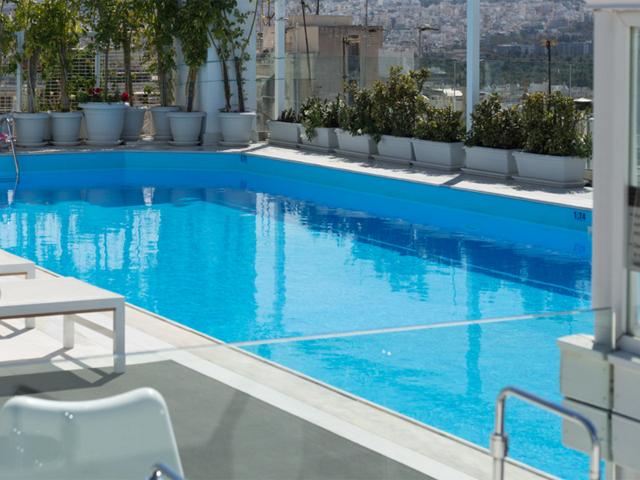 The pool bar features expansive city views of both downtown Athens and the Acropolis. Private dining in your room or on your balcony is the perfect way to treat yourself during your stay with us, and allows you to take in the marvelous view at your leisure. Our experienced team is available for any additional requests to make your occasion extra special! The St George Lycabettus Hotel is delighted to provide a host of services to make your stay with us an unforgettable one. Taste the flavors of Greece, the wines our Greek beautiful vineyards produce, swim and sunbathe in the Athenian sunshine, soak up the culture in our in-house Art Gallery and pamper yourself at the spa. Rejuvenate body and soul in Greece! The St George Lycabettus Hotel offers 154 contemporary bedrooms and suites, carefully designed for ultimate comfort and relaxation in Athens. Many of our hotel rooms and suites offer breathtaking Acropolis views and updated eco-chic features. Select the room type that best suits your needs amongst our choice of boutique accommodation. Check out here our new video portraying our rooms and their views. Visit our offers page. Size approx. 15-20 m2. Overlooking the interior of the hotel. All rooms with large “wall to wall” windows and plenty of natural light. Individually decorated, featuring neutral tones and relaxing colour scheme, Coco-mat fine bed linens & towels. Exterior view room: size approx. 15-20 m2. Partial view of Lycabettus hill, many with private balcony. Individually decorated, featuring neutral tones and Coco-mat fine bed linens, modern bathroom design & Coco-mat towels. Βοutique Acropolis room with view of Athens and part of the Acropolis from the private balcony. Each room is approx. 15-20 m2. Coco-mat fine bed linens, modern bathroom design & Coco-mat towels. Faces part of the Athenian capital with private balcony. Warm colors, clean lines, wooden details and gentle luxury are the main characteristics of our Eco-Chic rooms. All rooms are equipped with COCO-MAT’s natural sleep systems , bedding , white linens and furniture distinguished both for its innovative design, as well as it’s functionality in order to make your stay unforgettable. Panoramic Acropolis View room with breathtaking view of the Acropolis and the city of Athens with private balcony. Room size approx. 15-20 m2. Individually decorated featuring neutral tones, modern bathroom design, Coco-mat fine bed linens & towels. Size approx. 27 m2. Situated on 2nd, 3rd, 4th and 5th floor. Overlooking the Lycabettus hill, with private balcony on 3rd, 4th and 5th floor. One bedroom and one elegant living room. Individually decorated featuring neutral tones. Modern bathroom, design featuring Coco-mat towels & fine linen. Panoramic Acropolis View Suite: Size approx. 35-40 m2. Breathtaking view of the Acropolis, panoramic view of Athens, Saronic sea and Lycabettus hill. Individually decorated featuring neutral tones or animal prints or chrome and marble, Coco-mat fine bed linens & towels. Bedroom and sitting room, both with private double balconies.